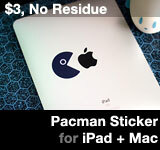 Full product description on Obama Pacman Sticker or the DIY White iPhone 4 kit page. UPDATE: Since Google Checkout closed on November 20, 2013, all payments are processed with PayPal. PayPal supports over 190 countries, way more than Google Checkout ever did. Information below from 2009. To order use: Obama Pacman Sticker or the DIY White iPhone 4 kit page. Flat rate for your international order ($2.50 ship + $1.50 international surcharge). Shipped with United States Postal Office, First Class mail. These typically go by air to your country, then goes to ground delivery from your postal system. Expected delivery days is seven to fifteen days after shipping for international orders. If you are in the US, and Google checkout doesn’t work for some rare reason, then use this page to order via PayPal. If you ordered within the US, then the shipping should be without the international surcharge. But if it’s not, sent a note with the order and the difference will be refunded to you. Note information below is from 2009. It may differ now. I. When you add item to your PayPal cart, you might see that your country is not listed on the shopping cart page shown above in image. Please note that short list of countries says “Select ship-to country (optional)”. It’s OPTIONAL on this page, so ignore it! II. On the next page, you’ll enter your billing address or sign in to your account which has your billing address. This is where you select your country.